I often feel overwhelmed because I don’t feel I measure up to all that’s expected of me in living the gospel. How can I learn to rejoice in the gospel when I feel like I may never be able to become or do all the Lord requires of me? When I was on my mission in Brazil, I often struggled to feel my offerings were adequate. I would look at other missionaries and agonize over why I was not as valiant as they were. Then one day I remembered some advice my father had given me while I was in the MTC. “The only way you’ll ever be able to eat an entire elephant is one bite at a time.” Throughout the rest of my mission, my mom would send me paper elephants with more and more “bites” taken out of them, symbolizing what I was able to accomplish one day at a time. I finally learned to be patient with myself and love what I was doing instead of constantly criticizing myself for everything I wasn’t doing. Often, we feel like we can’t possibly do all that is asked of us, but if we remember that Christ teaches us “line upon line, precept upon precept,” (2 Nephi 28:30) we can accomplish great things and enjoy ourselves along the way. Like many, I have had a difficult time combining spiritual priorities with the other demands of life. Being the mother of six children keeps me very busy, and it can be difficult to accomplish all the things I am supposed to do. One day, I finally took the matter to the Lord in prayer. I felt the Spirit whisper to me that like Martha, I was careful and troubled about many things, and because of that, I was not doing the needful things. I have since adjusted my priorities. Instead of saying, “If I have time I will read my scriptures,” I now say, “I will read my scriptures and then accomplish what I can.” In time, peace returned to my life because I knew I was doing the things that Heavenly Father wanted me to do first. It is easy to be like Martha when there are many things﻿—often good things﻿—that need our time, but I now find I am able to accomplish so much more because my mind is focused on Heavenly Father’s will and His purposes for me. I know that if I continue to put the Lord first, He will bless me with strength, peace, and joy. As a Scoutmaster of many years, I’ve learned a few guiding principles from the Scout Oath. The first few words state, “On my honor, I will do my best to do my duty to God and my country.” These few lines parallel one of Christ’s powerful teachings in the New Testament. In Matthew 22, a lawyer asked Jesus, “Master, which is the great commandment in the law? “And the second is like unto it, Thou shalt love thy neighbour as thyself” (verses 36–39). Both the Scout Oath and this scripture indicate that our first duty is to God and our second is to our neighbor. It takes a lot to love the Lord and our neighbor, but if we can remember what the Savior said next in verse 40, we gain better understanding: “On these two commandments hang all the law and the prophets.” Loving the Lord and loving our neighbor is as simple as it gets. If we can live by these two rules, our light will shine so brightly that our goodness will far outshine our greatness. Sometimes it may seem that if we get out of bed in the morning and by bedtime have not managed to feed and tend the children, bake homemade bread, finish all the housework, study the scriptures, do our home or visiting teaching, attend the temple, do family history, go to choir practice, prepare a lesson or talk for Sunday, and finish cross-stitching the Ten Commandments, we have failed. Don’t worry﻿—there is always tomorrow. The key is faith. When we stay close to the Lord and obey His commandments, we can be prompted by the Holy Spirit to know what our priorities are each day. We can also take comfort in the fact that Heavenly Father knows us. He knows our hearts, our trials, our strengths, and our weaknesses. We can start moving toward peace by accepting that He loves us, despite our imperfections and limitations. We wouldn’t ask our own children to do everything in one day while we sit back and watch and then chastise them for the jobs left undone. Heavenly Father won’t either. I know that He loves us and will help us. “And it came to pass that the wind did never cease to blow towards the promised land while they were upon the waters; and thus they were driven forth before the wind” (Ether 6:3, 5, 8). As I thought about the furious wind tossing the Jaredites upon the waves, it seemed the wind was more of a curse than a blessing. But I felt impressed that without the wind, their journey would have been even more arduous and long. How long might it have taken to reach the promised land without those fierce winds? The wind, which appeared to be a trial﻿—something to beset their journey﻿—was a blessing from a loving Father. That same loving Father would never leave me alone to endure the darkness of my trials. He is there. His light will guide me. As the fierce winds of adversity blow, I will remember His hand in all things. Though I will certainly face other trials and adversity in my life, I realize I can find joy through faith in a loving Heavenly Father. I have found his promise to be true. If I make an effort to prayerfully consider my responsibilities, my priorities, and the time I have available on a given day, it soon becomes clear to me what the Lord would have me do. I have found He never asks more of me than I can manage. Letting the Lord help me determine what is most important each day gives me confidence in my decisions and assurance that He is pleased with me. Many years ago I attended a stake Relief Society conference in Colorado. A speaker used an analogy that really impressed me. She asked us to think about how children learn to walk. We as adults give encouragement and praise. We stretch out our arms and invite them to come to us. When just learning, children are often a bit fearful and hesitant, but with our continued encouragement, they continue to try. They may only get one step taken before they fall, but we don’t berate them or scold them or give up on them. We pick them up and help them because we know that they can successfully learn to walk. We do not love them less because of their stumbling. She likened that to our relationship with our Heavenly Father and Jesus Christ. God sent us down here to learn His ways and to walk in His path. At times we may hesitate and fear, but our Heavenly Father and our Savior will always encourage us and help us because They know we can succeed. When we stumble or fall down, They do not berate us or scold us or give up on us. They continue to stretch out Their arms and beckon us to “come.” They know we can succeed, and They do not love us less because of our stumbling. Keeping in mind the image of our Heavenly Father with outstretched arms, as mortal parents do to their learning child, can help us through our trials. Accepting His encouragement and love can give us the faith we need to strive to do better. Henry B. Eyring, “This Day,” Ensign, May 2007, 89. “Let me cite a hypothetical example of a dear sister in any ward, the one who has perfect children who never cause a disturbance in church. She is the one working on her 20th generation in her family history, keeps an immaculate home, has memorized the book of Mark, and makes wool sweaters for the orphaned children in Romania. No disrespect, of course, intended for any of these worthy goals. Now, when you get tempted to throw your hands in the air and give up because of this dear sister, please remember you’re not competing with her any more than I’m competing with the members of the Quorum of the Twelve in winning a 50-yard dash. 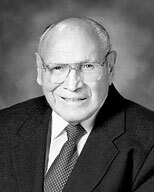 Elder Joseph B. Wirthlin (1917–2008) of the Quorum of the Twelve Apostles, “One Step after Another,” Ensign, Nov. 2001, 26. I have heard Church leaders say that those of us who come from dysfunctional homes can be “cycle breakers.” I want to build a life founded on righteous traditions, but I’m not sure how I can be and do something different than what I’ve been shown and taught my whole life. Where do I start? If you would like to share your ideas, please label your submission “Cycle Breaker” and follow the guidelines under “Do You Have a Story to Tell” on page 2. Please limit submissions to 500 words and submit them by March 18. It is easy to be like Martha when there are many things that need our time, but I now find that if I put the Lord first, He will bless me with strength, peace, and joy.